The Corvette that made America proud in road racing around the world is getting ready to move to GT2. LONG BEACH, Calif. – Corvette Racing will run its last GT1 class race in the American Le Mans Series during this weekend’s Long Beach Grand Prix. Although a possible bankruptcy at GM could change current plans, the factory team is scheduled to return to the ALMS in August with a new car and a different mandate to race in the production-based GT2 category against Porsche and Ferrari, among others. When this final chapter to Corvette’s illustrious run in GT1 is complete, a little known footnote to history will remain. It’s hard to imagine amidst the palms on the sunny, seaside streets of Long Beach that once upon a time a gritty oval track hero known as the Intimidator wanted to start his own road racing team featuring America’s sports car. 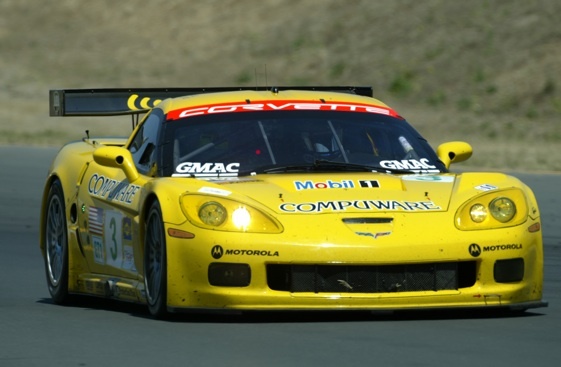 In 1999, GM launched the Corvette Racing program with the goal of winning at Le Mans. A short while later it had a new convert who wanted to help GM Racing reach that goal: Dale Earnhardt Sr. After co-driving a Corvette at Daytona’s 24-hour, Earnhardt Sr. decided he wanted to compete in Corvettes, maybe even before his retirement from NASCAR competition, especially at the Le Mans 24-hour. But two weeks after finishing fourth at Daytona’s 24-hour with Dale Earnhardt Jr., Andy Pilgrim and Kelly Collins, Earnhardt Sr. suffered his fatal crash on the last lap of the Daytona 500. Despite having laid the groundwork to set up his own Corvette team, Earnhardt Sr.’s death ended DEI’s plans to enter sports car racing. It might have been like a big Brahma bull in a very small China shop, but fans at street circuits like Long Beach never got a chance to see the Intimidator as an all-out road racer. “Dale told me he was having the most fun he’d ever had in racing,” Fehan recalled of that first weekend of February in 2001 when the Earnhardts, father and son, joined the two-car Corvette team at Daytona after two months of practice and preparation. The testing in December and January had included one bad crash in practice at Sebring by Earnhardt Sr., who confessed to Fehan that he needed more treadmill work to gain the stamina necessary for braking and shifting in a Corvette cockpit known for the heat from a massive V-8. In the 24-hour, Earnhardt Sr. was loaded for bear. Driving the number 3 Corvette in rain that began falling during his final stint shortly after dawn on Sunday, Earnhardt Sr. tried to persuade Fehan over the radio to let him stay in the C5-R for a third stint. Earnhardt Jr. found co-driving with his famous father put the two on more common footing in racing for the first time. Although Earnhardt Sr. insisted that his son wear an open-faced helmet just like his own while driving Chevy stock cars for Dale Earnhardt Inc., Earnhardt Jr. wore a full-face helmet aboard the Corvette. In the wake of his Earnhardt Sr.’s tragic NASCAR accident, in June at Le Mans the Corvette Racing team received a letter from his widow Teresa Earnhardt wishing the team good luck. Fehan read the letter aloud to his gathered team in a closed garage during final preparations for the great French race, which Corvette won for the first time. In a ghostly irony, Earnhardt Jr. was scheduled to co-drive a factory Corvette with Boris Said at the Infineon Raceway in 2004 when near tragedy struck. Spinning in the morning warm-up, Earnhardt. Jr.’s Corvette was enfulfed in flames due to a broken fuel filler pipe and he narrowly escaped by diving out the window. He was dragged to safety by a corner worker after suffering second degree burns to his legs and neck. A star-crossed destiny with the Earnhardts has been one of the few major setbacks for Corvette Racing. In that breakthrough year of 2001, the number 2 factory Corvette driven by Ron Fellows, Johnny O’Connell, Chris Kneifel and Franck Freon won over-all at Daytona’s 24-hour. With Scott Pruett joining Fellows and O’Connell at Le Mans, the team won in virtually non-stop rain and it took top honors in the Petit Le Mans at Road Atlanta. In the past decade, the Corvette team has defeated the Viper, Ferrari and Aston Martin at Le Mans, where it has been the winner in the GT1 class five times in nine entries. With 75 total victories worldwide by the C5-R and the succeeding C6.R, there’s just one GT1 race in America remaining at Long Beach before returning to Le Mans to bid adieu in GT1 competition in June, where the team hopes to avenge two straight losses to Aston Martin Racing. Then Corvette Racing intends to re-invent itself by turning to the less expensive GT2 category and eventually selling customer versions of the new cars to defray expenses for the factory team. That means the end of the line to the mighty and expensive C5-R and C6.R cars, which were based on production platforms but purpose-built from the ground-up for racing and powered by 7.0-liter V-8’s. Long Beach “will mark the closing of one chapter, the likes of which will never be written again in Corvette history,” said Fehan. “At the same time, it will mark the opening of another chapter that will eventually see Corvette competing in a global GT class under the international regulations that will come into effect next year. I have a large inking of this most famous corvette on my den wall. I think of Dale Sr. every time I glance at it.